Christmas was the largest ever and I sold out of many of my most popular items before Christmas, it would have been double if my manufacturing partners would have delivered product on time. One great thing is my return rate was really low. I began ordering general stock. For Valentine’s Day sales were better than expected since my stock was quite low because of past due deliveries. But things are on order and I was hoping to get my welders and metal workers back on schedule. February 10th received some stock but, too late for Valentine’s Day. Bummer! 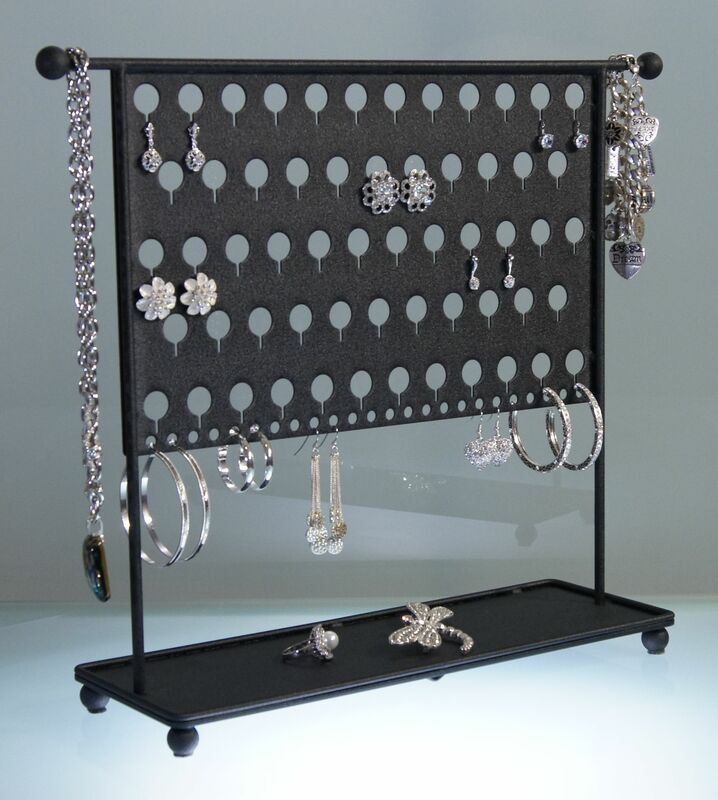 Almost sold out of all of my Jewelry Tree C now called the Carol Jewelry Tree. I hope the stock I ordered last year arrives soon. The Accessory Angel stock is getting low …. time to re-order. The overall design and layout will be the same. I needed to revise the design for several reasons, I made in 2” smaller in width so it would fit on most customer’s wall space. It was 16 ½” wide and the revised one will be 14 ½” wide. The necklace hooks will be thicker to accommodate heavy necklaces. 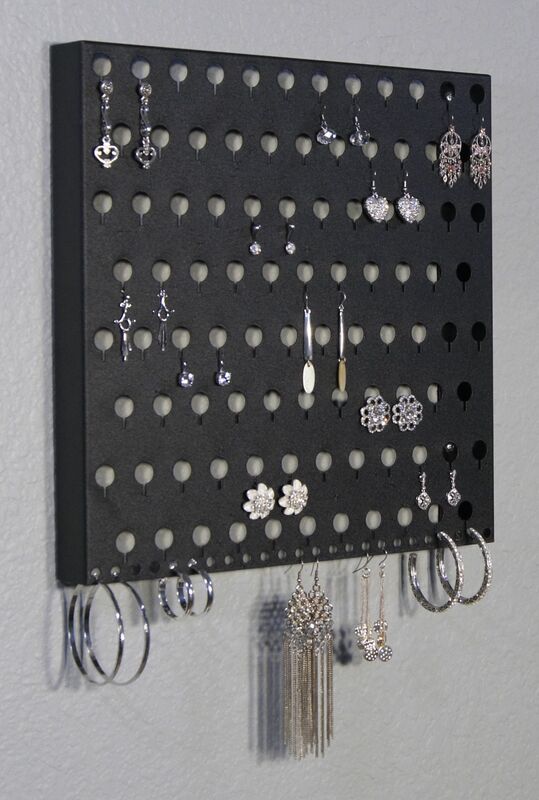 The capacity will be a little bit less instead of 55 pairs or earrings with 29 necklace hooks; it will hold 48 pairs of earrings with 25 necklace hooks. I ordered general stock 2 revised products JTA now revised and named Sharisa and the Accessory Angel and introducing one new product EATM now revised and named Laela Earring Angel a Contemporary Earring Holder. 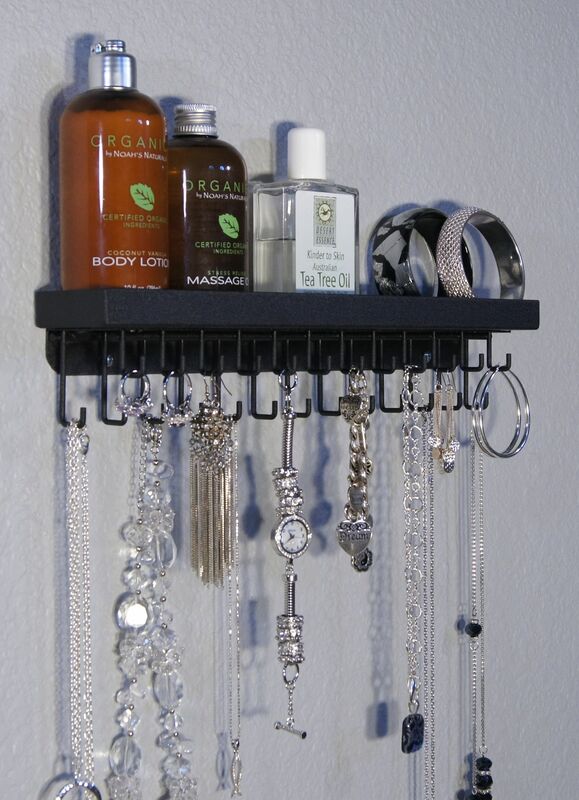 I ordered more Accessory Angels, JTA/Sharisa Jewelry Trees and introduced a new product ATH/now named Schelon Wall Mount Necklace Rack for trial. I have had some requests for something like this over the past few years, we will have to wait and see if IT shines! Powder coat changes: Instead of the Tuscan Bronze this run we will be using Chateau Brown. The new revised Jewelry Tree A/Sharisa I just made the hooks thicker, the crossbar thicker and the knobs larger plus I added weight to the base. This was because so many necklaces now can be quite chunky and heavy and these revisions just make Jewelry Tree A/Sharisa that much better! For Mother’s Day sales were pretty good with Sharisa Jewelry Tree being back in stock! I was very concerned about lead times, quality control etc. on my partners end. I started seriously looking for another one. I finally received Jewelry Tree C/Carol in Black but the powder coat was actually flaking off. So I had to send this much needed stock back to my Chicago Mfg. Partner. Big Change in May, Hello FBA: Amazon has contacted me several times asking for me to enroll in Fulfillment by Amazon, because of my feedback, return rate being so low, product reviews and customer service. I was very hesitant in doing this, what if they lost stock? What if it gets damaged? What if, what if what if! I was not sure how much it would cost me additionally and cut into my profits. I would have to pay warehouse storage fees etc., and make less per item, plus they would have control over my stock (my seed). When you build something especially from nothing it is hard to let go and trust someone to do what you have done so well and for so long to your high standards. After careful consideration I decided to look into it because the packing and shipping is a very physically laborious job added to everything else I do: keeping inventory, designing new products, quality control, marketing and promoting, selling, answering emails, bookkeeping, customer service etc. Plus I also run my husband’s business and all that entails marketing, customer service, scheduling, bookkeeping etc. No wonder I get tired…. May 26, 2010 – I began FBA – Fulfillment by Amazon. I had product freighted to me to unpack, inspect, make ready, re-pack, label and re-freight to Amazon Warehouses for them to do the customer fulfillment. At this time the quality control issues I was having forced me to have to inspect every single product. My Chicago Manufacturering Partner orders were taking over 9 to 12 months to complete. So I went to Chicago to have a face to face meeting about new products and current products on order, lead time and quality control. I saw many of my orders cut but not formed yet. They promised me 2 to 4 more weeks. I did not receive these until November 2011. It this time I was really starting to feel the constraints of people hired not doing their job as promised, just one reason why it is hard to let go and trust someone with you business and livelihood. While I was waiting for stock and it became apparent I needed to start ordering for Christmas since things are running so far behind. They again made me promises that if I placed a new order I would get them in 6-8 weeks and with no other choice I had to place more orders with them. At this time I was actively seeking to find my own welders and powdercoaters. My hope and expectation was that it would arrive on time but not all at once because I of the net 30 payment schedule. Amazon Fulfillment is working quite well so far, no problems. I had to re-order Jewelry Tree C/Carol to make sure to have it in stock for Christmas; I did not receive this order until August 2011 and I lost placement visibility in search engines again. Amazon Fulfillment was underway. Up until this time I had only shipped FBA the Polycarbonate Acrylic Earring Angels to test the program. Jewelry Tree B/Betty and Ava and some of Jewelry Tree C/Carol finally arrived. These were ordered the first week in January, taking over 7 months. FBA, this is when the even harder work began to get the shipment ready for Amazon. I needed to test the FBA program and so I jumped in and got started. Working in my garage in the heat of summer and making my home a production assembly line was tough. It was about 104 degrees with about 90% humidity. I was working hard sweating in my garage for weeks on end, but with the hope that I was building some sweat equity. Summers are brutal in Texas, and doing all of the unpacking, inspecting, make ready, re-packing, labeling and freighting is a major job. Since I had no other option I had to re-order Jewelry Tree A/Sharisa and the Multi-Purpose Earring Angel with the same delayed manufacturing partner to make sure I would have it for Black Friday and Cyber Monday the busiest shopping days of the year. Sales for August were pretty good all things considered for some reason this was my best month so far in 2010, I think it is FBA and finally getting some minor visability back. Amazon from time to time offers free shipping, something I cannot afford to do, and super saver shipping which helps customers afford my products a little easier. I am noticed a portion of the physical load started to lift for the first time since 2005 when I first started selling online. FBA is going well, although it was a lot of physical labor to get it there. I went to visit my manufacturing partner face to face to deal with the same issues and also for the 1st time met with a few welders and powdercoaters that I ended up hiring. October Sales did start to slump because I was sold out of my 2 of my best sellers. I kept pushing on through and working hard to stay positive! What I am finding at this point is that I basically I work all year long for free and the Christmas Season is when or IF I make my profit. The JTA/Sharisa had just started moving again. Since, I was sold out for so long it was going to take some time for them to become visible again on the search engines. My Christmas stock never arrived. Major setback….promises broken by my manufacturing partners….stock was not here by Black Friday or Cyber Monday. I did not have the stock I ordered in Spring or Summer 2010. What limited stock I had completely sold out in early November. So another year of Christmas selling out and being out of stock…..therefore losing placement in search engines….therefore when things are back in stock waiting 3 to 6 months to have visibility again. December 10, 2010 I ordered my new Sariea Earring Angel that were completed February 24th just in good time just too late for Valentine’s Day. They are doing a great job. Now looking forward to 2011. Christmas was a disaster in many ways. I have been set back an entire year because of manufacturing delays. It was more than I could tolerate. Another year of being sold out of many of my most popular items before Christmas was so frustrating….products in demand…products that are selling even in this recession. For Valentine’s Day I was still sold out of most items but 2 were here. As it turns out the Schelon is a winner! I made a few improvements to the design and and made them. New hires to make my products but they are limited to what they can do. I was still waiting for stock I ordered last summer from my original partner in Chicago, they kept promising a few more weeks. I formally requested to cancel the 4 remaining orders with partner but they would not cancel them. I told them pick any date, any date, I don’t even care…… but whatever date you pick you must deliver. They promised that they would have all my open orders delivered to me by August 1, 2011. It did not happen it was October, but at least now I have some Christmas Stock for 2011. Mother’s Day sales were really great the best month of May ever! Even though I do not have everything in stock which is amazing. Amazon is a God Send! I would have gone out of business by now if it had not been for them. One Year with FBA: Fulfillment by Amazon was flowing very well. But this is the time of year I basically work for free and wait to make my profit at Christmas. I was working so hard and for the hours I was putting in it did not feel like I was making a profit and at times I would get quite discouraged. Things were looking dim and I needed some encouragement. Then I got it! It was the very best month of sales ever for May! I reason to continue to hope! Stock is coming in from both manufacturers. Chicago’s quality was great just way to long lead time. The new manufacturer had quality control problems that we are still working on. The work is still very laborious for me, but in spurts when stock is ordered, packaged and shipped to Amazon. Hotter than you know!!!! Hydrate and take breaks! The sweat burning my eyes and my arms and back are so sore….but I have to get it done. Unpack inspect, make ready, package, pack pallets and ship to FBA. Over 72 days of over 100 degrees most of which are over 103 to 105 degrees. Working in this heat was horrible. Seriously!!!! It was still in the 100’s! I finally completed re-packing to ship to FBA Warehouses. Sales had dipped some and I was hoping this would not be a sign of the coming Holiday Season. Finally I received all some of my orders from June, July and September 2010. I was hoping that I had not lost too much visability, but I did. I needed some more Christmas Stock in certain items I was hoping for this to be the year I would have almost everything in good inventory. Now that some time has passed and I can see that even with the costs to sell, FBA, warehouse fees and freight etc. I am able to make a profit. Trying to gear up for Christmas but without 1/2 of my product inventory due to my old Chicago Partner that I had to let go. Product missed Cyber-Monday and Black Friday, but I was still able to break sales records of previous years, quite amazing. But it makes me wonder what would I have sold if I had all the stock I had ordered over 6-9 months ago? Christmas with FBA: For this holiday season I did not have to physically work so hard. FBA did the work for me. I did not have to daily pack up product to ship to customers and cart it all down to the post office. I was able to ship every other day from the other minor sites I sell on, so I had a bit of a break compared to Christmas’ past. I think I may actually get some of my life back 🙂 while making a profit. Christmas broke all records even though I did not have everything in stock.